The Lloyd’s market’s pre-tax loss of $2.8 billion in 2017 was partly due to hurricanes and wildfires in the third and fourth quarters. But these losses were exacerbated by the continued deterioration in its attritional or non-catastrophe losses, brought about primarily by price deterioration in a competitive marketplace. The market reported $6.4 billion in major claims in 2017, more than double both the level of 2016 and the long-term average, Parry said, noting that last year’s catastrophe claims added 18.5 percent to the combined ratio. Overall, the Lloyd’s market paid out $25.9 billion in all claims (gross of reinsurance) during 2017, according to the Lloyd’s annual report. “The Lloyds market has met these substantial commitments without any significant impact on total resources, which remain strong at [$39 billion],” said the report. The market’s attritional loss ratio was 58.9 percent in 2017 compared to 53.3 percent in 2016. Even without the major claims of 2017, the combined ratio would top 100, “so remedial action needs to be taken,” he added. One important remedial action is, of course, to assure that premium prices cover the cost of risk. The good news is that the market saw an average increase in pricing of about 2 percent during the fourth quarter of 2017 and, during the January 2018 renewals, an average increase of 3 percent, he affirmed. For the full year, however, premium prices declined by just under 2 percent. The question is whether such upward pricing momentum will be maintained through the next important renewal dates of April 1, June 1 and July 1, he continued. After the third-quarter losses, he said, the market “responded on a business-as-usual basis” and injected $4.2 billion in new capital on Dec. 1, partly as a result of the storms but also to be able to pursue additional business opportunities. Parry estimated that approximately $2.8 billion of that amount was in response to the storm losses, with the remainder providing the capital for new opportunities. As a result of this recapitalization exercise, Parry said, capital and resources are at the same level now as they were prior to Hurricanes Harvey, Irma and Maria. “Lloyd’s operates a full distribution model, so if [a syndicate is] in surplus, we release excess capital. When there are losses, you’re required to inject capital or scale back your business to match the capital you have,” he said. Syndicates that write U.S. windstorm carry capital for that exposure, he said, noting that losses were spread well across the market. Further good news for the market came with its release of prior-year reserves of approximately $989.4 million, which reduced the combined ratio by 2.9 percent, he said. During 2017, Lloyd’s reported an investment return of 2.7 percent compared to 2.2 percent in 2016. Gross written premiums during the year were $47.5 billion compared to $42.3 billion in 2016. Parry noted that about half of the increase in gross written premiums was attributable to movements of foreign exchange. 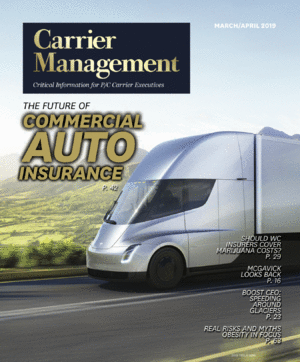 *A version of this story appeared previously in our sister publication Insurance Journal. May’s ‘Ring of Fire’ Storms Will Produce $2.5B in Insurance Claims: Karen Clark & Co.